I attended a great talk on June 7th entitled, Using Concept Mapping and Problem-Based Learning to Encourage Meaningful Learning (presentation archived here). It was delivered as part of the TeachU series offered through the Ohio Learning Network. The presentation was by Ellen Lynch, Tracy Herrmann, and Margaret Cheatham at the University of Cincinnati. 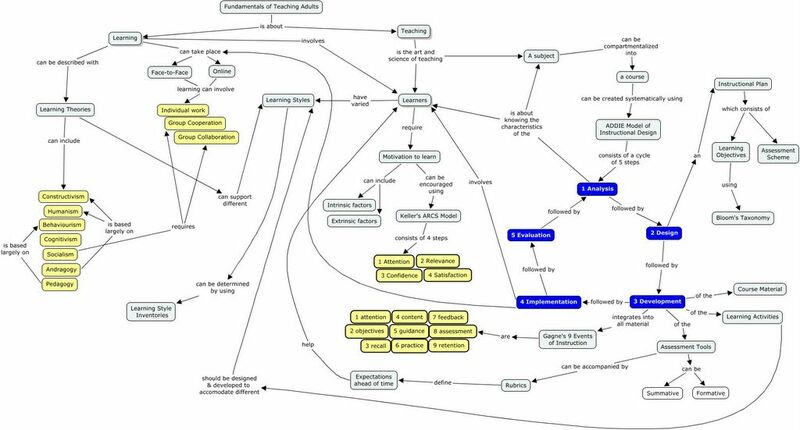 I really enjoyed the way the way they introduced the use of their concept mapping software of choice: cmap tools. I had never used this free software before and seeing it in action in this setting really peaked my interest. So I downloaded it the next day and I tried it for myself. It really is easy to use. Ellen and Tracy describe many ways in which they used concept mapping to create meaningful learning in their students. The one way that they described that I really liked was to use two concept mapping activities as a way for students to validate their own learning. 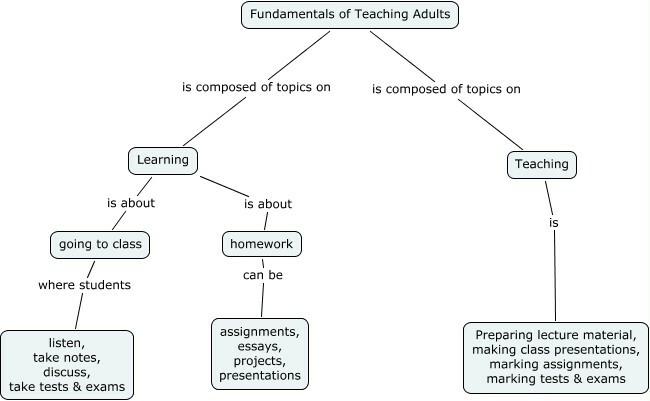 Prior to a term beginning, or prior to a unit beginning, students are asked to a create a concept map describing what they know about the subject. At the end of the term, or unit, students create a new concept map depicting what they know about the subject. In the second concept mapping exercise, Ellen, Tracy and Margaret invariably see that students demonstrate far more knowledge and that they are able to show relationships between related topics. This rings true to me. I’ve never done a concept mapping exercise as they describe; however, I have used pre- and post-testing and I have seen dramatic results. One of my interests about concept mapping is that this thoughtful, and thought provoking, activity can demonstrate relationships between concepts. It’s not simply a regurgitation of facts. Students must demonstrate higher cognitive levels of thought by analyzing, synthesizing and evaluating the knowledge they have gained during the term or unit. Clearly a student who can prepare a complex concept map showing how parts of the course interrelates with each other is showing understanding of the concepts. It’s an excellent post-learning activity. Another facet of this that I like a lot is that there is an element of creativity built in. It is likely that if you conducted this activity with a large class, that you would get several creative designs to the concept map. As an instructor, examining some of the concept maps created by students might just open new ways of thinking about the material for myself. That can be a wonderful side effect! I’m going to try this in the Fall term with a Chemistry course I’m teaching. I’ll be sure to report back here on how the activity went. If you have any interesting ideas about concept mapping, feel free to share them in a comment by clicking the ‘comments’ word below. I like your concept mapping for adult learning. Will download the software, seems very big. Nice and free. How does this software compare to inspiration? In my practice, the big challenge is modifying how instructors deliver. I have suggested many times that they use concepts maps, but some how the transition from lectures to student-based learnings has been long and difficult. Good luck. I have used Inspiration as well. In fact, I used to use it as my software of choice for flowcharts. However, Cmap Tools blows Inspiration away. For two main reasons: 1) It's free, and 2) I find it easier to use. So to use it in a classroom setting where students must create their own concept maps, at school or at home, works perfectly!